I really wanted to like this more, I did. Eric and Ryan both thoroughly enjoyed it, and when it started, so did I. I could not stand Zoe Kazan’s character, Kathy. Ick, that is all I am saying. However, that in no way reflects negatively on her performance. She was brilliant, as was Ella Ballentine. They were so believable, and emotional, and that was pretty much what kept me going. 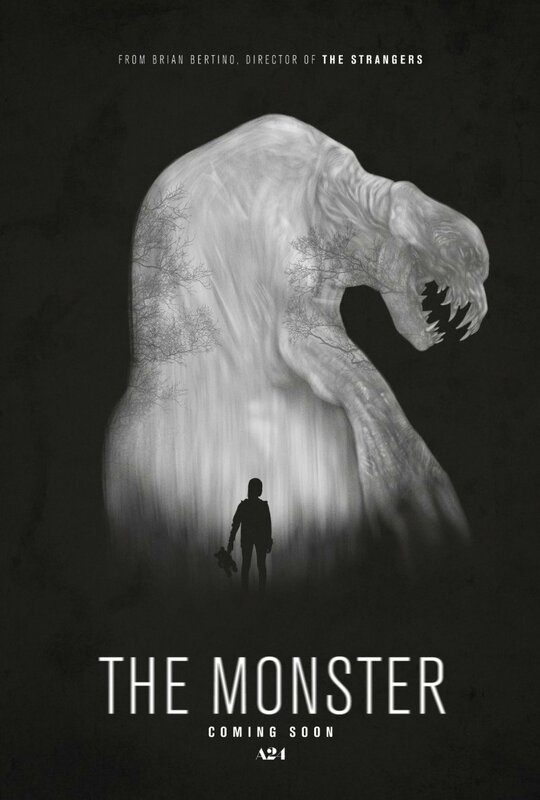 The Monster starts well, and builds a fantastic, tense atmosphere that draws you in. We are all afraid of what’s potentially out in the dark, so this works really well, because it feels like there is something out there. Then strange things happen. Never overplayed. You never see whatever the hell is out there (less is more man, less is more), and it just works. The atmosphere is heavy, and it is dark, rainy, dreary, plus there is all the emotional tension between Kathy and Lizzy, so you are totally engaged. Something is out there, and it is scary as hell. The music works, and it is shot so well. But then things started going south. For one, I was quite annoyed at the immense amounts of flashbacks. Like, I get that they are developing the characters with that, and showing us how complex the relationship is between mother and daughter, but even with all that, the characters still feel really flat unfortunately. Lizzy and Kathy are still better than others. I also thought that the movie was rather predictable, and I was not pleased when we saw the monster. Not because it was crap, but all the creep was taken right out when I saw it. A movie can lose me when revealing too much. Also, let us not forget how that third act just fell apart. Everything was going so well, and then next thing logic went out the window and some of the most ridiculous decisions ever were made, the atmosphere was forgotten, it pushed for too many jump scares, both mother and daughter became insufferable (even more so than before), and that showdown was so stupid. All in all it is not a bad movie, and the first two thirds were really good. The atmosphere for the film was wonderful, and Ballantine and Kazan deliver stellar performances. However, there is a lot that is wrong with the movie, too, and the third act really hurt it more than I can say. It is definitely going to appeal to horror fans who love atmosphere, but it won’t thrill those seeking a full on monster movie. This entry was posted in Movies and tagged atmosphere, Ella Ballentine, horror, mediocre, monster, movie reviews, movies, Zoe Kazan. Bookmark the permalink. Ah damn it all to custard. I wanted this to be good. The shape of that monster creeps me out. You haven’t seen it yet? You might like it. I liked it and then it just went South. Pity. The poster is fantastic. Thanks Jade! Ah, loved the poster. Had hopes for it as a lot of people I know really enjoyed it. I just hated how it fell apart. You are so right, a good horror movie is exceptionally difficult to find nowadays. A movie called The Monster without full on monster action? That’s not on! xD I mean just imagine! Plus when you do get some monster action, it’s beyond ridiculous – and not the fun kind.